Colorado Here We Come! GES Lands Legendary Coach Reid Kahl! We are so very fortunate at GES Advisory Company to attract the very best and brightest in the coaching community! Today’s announcement is no different with the addition of one of the most renowned coaches in the state of Colorado! Reid Kahl comes to the GES Team with an extensive football background. His father, Rick, was a highly successful high school coach in Fort Morgan, CO. His brother Kent was a high school All-American and fullback at the University of Iowa where he was Team MVP in 1994. He was also a scout for the San Fransisco 49ers. After playing collegiately at the University of Northern Colorado, Coach Kahl began his coaching career under his father, serving in various capacities including QB and DB Coach, Special Teams Coordinator, and Offensive Coordinator. While coaching at Fort Morgan High School, The Mustangs won state championships in 1992 and 1999. They were also state runner-up in 2001 and made 12 state playoff appearances. During the stretch of 1998-2001, the Mustangs compiled a record of 50-4. After a short stint at Coronado HS in Colorado Springs, in 2006 Coach Kahl was named the head coach at Wheat Ridge HS in Denver, CO. In his first year, Wheat Ridge went 13-1 and won the 4A state championship. He was named Colorado HS Coach Of the Year. In 2008, The Farmers capped off a 14-0 season and again won the Colorado 4A State Championship where Coach Kahl was named All Colorado Coach of The Year. In 2010, Wheat Ridge was the state runner-up, losing to a Christian McCaffrey -led Valor Christian team. The Farmers were also state Semi-finalists in 2010. 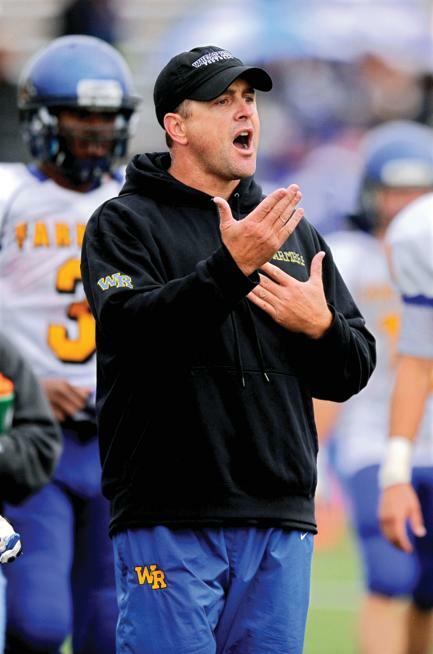 In 2013, Coach Kahl was named a Top 5 coach in Colorado by USA Today. He finished his career at Wheat Ridge in 2013 with a record of 79-19, and 14-3 in state playoff games. After moving back to Northeastern Colorado in 2014, Coach Kahl was the Head Coach at Brush High School in 2015 and 2016, where he led the Beetdiggers to the state quarterfinals in 2015. He has been a featured speaker at numerous football coaches clinics, and has also been invited to work several football camps including The University of Colorado, The University of Iowa, and Colorado State University, as well as The University of Wyoming. Reid has 4 children. Kalen-24, Ryen-20, Hayden-7, and Landry-6.